The coming of spring is a bright time for sun, warm rains, and growing plants. But if your lawn is suddenly sprouting gray-hued circles, you may suddenly feel less than ready for the new season. These unsightly lawn blemishes may be the result of snow mold, a fungus that attacks cold-weather grass and often doesn’t become visible until spring. 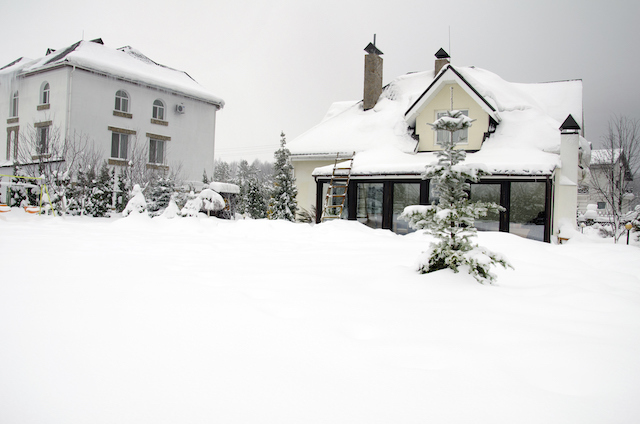 Often, snow mold occurs when there is a heavy snowfall before the ground has frozen over for the first time. The combined effects of winter moisture and weight on top of fragile plants can cause severe damage. If there is any material on top of the grass, like decaying leaves or old grass clippings, the combined moisture and pressure with the decaying matter can result in the growth of either gray or pink snow mold. Once the snow has begun to melt for the year, you may start to see the signs of this damage. With both types of snow mold, you’ll begin to notice circular patches ranging in size from several feet to a few inches across beginning to form. Often the remaining grass will be crusty and matted down due to the damage. Gray snow mold will have a whitish-gray appearance and will usually only affect the grass blade making it easier to treat. Pink mold, on the other hand, is more severe and affects both the blade and root and has a pinkish-white appearance. Unfortunately, there is little that can be done once snow mold has taken effect. In the case of damage to the grass blade only you might try raking the affected area to loosen the soils and allow any surviving roots to have room to regrow. Before the start of winter, you can add a lawn fungicide to your yard to prevent the possibility for snow mold growth. You can also avoid issues by ensuring the lawn is cut to a shorter length and by raking away any leaves and debris before the first snow falls. For areas that have been significantly damaged the best course of action is to use a patching product that reseeds and fertilizes at the same time. This entry was posted on Friday, February 8th, 2019	at 3:42 pm	and is filed under Landscaping Maintenance	. You can follow any responses to this entry through the RSS 2.0	feed. Both comments and pings are currently closed.